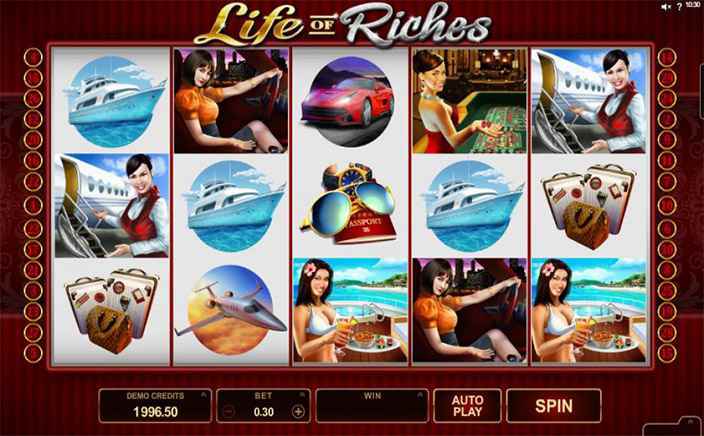 Life of Riches is a slot game based the theme of rich and lavish women. This slots game gives a glimpse of how the rich ladies of our society lead their lives. It has 30 betting lines spread over five lines and three rows. The slot is set over the rich looking red carpet for a grand entry. There is nice upbeat party music playing in the background. It has rich and colourful graphics with rich ladies in different attires. The betting, however, has a reasonable limit that starts from £0.01 and goes up to £15 per spin. This wonderful game based on the life of rich and wealthy ladies was developed by Microgaming. They are a leading casino games developer with experience spanning several years. They have expertise in advanced gaming technologies that enable them to allow users play their games on mobile devices as well. The symbol of Life of Riches slots is five pretty women with the rich outfit and attractive expressions. There is a woman in red dress at a casino, an air hostess, a gold player, a girl in a fast car and a bikini babe on a yacht. The top paying symbol is the woman in red dress at a casino who pays £500 on five of her kind. To win that you need to have played with £15 as bet amount. The low payout symbols are a private jet, passport with shades and a watch, travel bags, a sports car and a luxurious yacht. There are two bonus symbols in this slot that helps you win enhanced rewards. They are a passenger plane and the game logo. Wild Bonus: The Life of Riches game logo is the wild symbol and it substitutes all the other symbols of the game. Wild can appear on all the reels and multiplies your winnings by 2x. Five of its kind even pays you £2000 when your bet amount is £15. During free spins, wild multiplies your wins by 4x. Scatter Symbol: The symbol of a passenger plane is the scatter and it gives you ten free spins. You need to get three or more symbol landings to win those spins. All your winnings during these games are doubled. 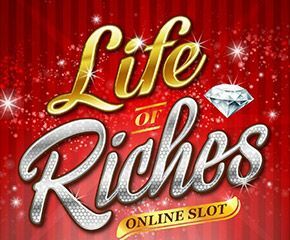 Life of Riches slots is a game that will make you feel jealous about women who flaunt their wealth to the core. The game offers stunning graphics with features that help you win big, super big and mega big rewards.